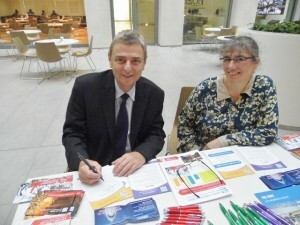 Dave Prentis, General Secretary of UNISON, and Helen Baron, President of London Capital Credit Union. Dave Prentis, General Secretary of trade union UNISON, has become the 11,000th member of London Capital Credit Union. Dave Prentis was signed into membership of the credit union as it launched an initiative to encourage more employers to offer transfers direct from employees’ wages to their credit union accounts. In the UK, London Capital Credit Union is leading the way in the fight back against loan sharks and payday lenders by encouraging more people to use credit unions. Over the past year, London Capital Credit Union has seen a 47% increase in membership and is keen to work with employers that can offer payroll deduction to their staff. London Capital Credit Union is dedicated to promoting saving and helping people deal with debt. It provides secure savings and low cost loans for anyone living, working or studying in Barnet, Camden, City of London, Hackney, Haringey or Islington. Over the past year, it has seen a 62% increase in loans to members but at the same time has seen members’ savings increase by 59% to £6.6 million. A typical £1,000 loan from the credit union, paid back over one year, would cost a total of just £67 in interest. This is a tiny fraction of what it would cost to borrow from a payday lender, for instance. This entry was posted in Credit unions, London Capital Credit Union, News and tagged Credit unions, Dave Prentis, London Capital Credit Union, UNISON on November 5, 2014 by Shaun.